Carb Conversions, Service Parts, Linkage, Air Filters, Etc. Only Genuine Made in Spain Redline Webers..No Chinese Carbs..
Special Deal on the Dual 40 or 45 DCOE DCOE Sidedraft kit. 40's are the correct choice for any Stock, Street, or Mild Race engine build up to 150 HP. 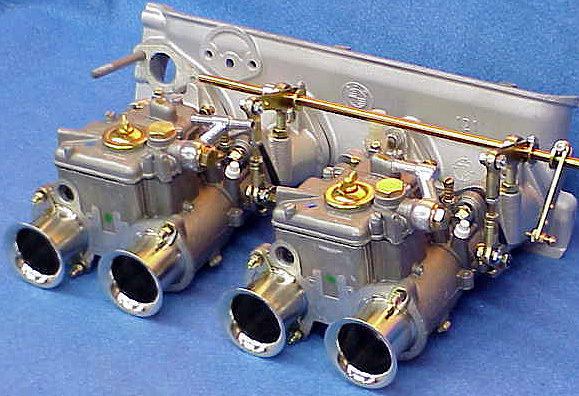 The Ultimate Single DCOE Manifold and Carb kit. 90% of the power of Dual Carbs with none of the hassle of Dual Carbs. This is the Ultimate linkage for all Dual Sidedraft Weber carb conversions. Also available for Single and Triple Sidedrafts on any make or model vehicle. Technical Pages Must Read Information ! Fuel Pumps and Pressure, Vacuum Leaks, Tuning, Float Level Settings, Redline Weber Tech Info, Ignition system tech and troubleshooting ! #1) All three digit K kits are for racing and offroad use only and must never be used on the highways in California. highways in California. See Exemptions in the notes column for E.O. tag Numbers. #3) All kits contain Necessary parts for installation, carburetor, manifold or adapter, linkage and air filter. #4) All kits require minor installation modifications and basic mechanical skills and hand tools. measurement of the installation for air filter clearance. ORDER AIR FILTER SEPERATELY. SEE PAGE 1 OF THIS CATALOG FOR ADDITIONAL FOOTNOTES.